Model:B4A1 with BRRS (Bolt Recoil Shock System). Ammunition Type: 6mm Plastic Airsoft BB (recommended .20 gram plus). Trigger Pull: The trigger pull on the Bolt Airsoft B4A1 is fairly short and light as it is essentially just an on off switch for the internal electronic components. You can shoot this gun very quickly in semi auto mode, and of course in full auto when full auto position is selected. As is with all AEG rifles there is a bit of a delay while the spring is retracted and released, this is not as noticeable in full auto. Accuracy: I tested the B4A1 Airsoft rifle by putting around 10 rounds into a target from 30 feet with .36 gram Airsoft 6mm BB's while using a semi rested position (sand bag in the front - standing in the rear). I used a non-magnified red dot scope for this test rather than using the built in iron sights. I got very good result in semi auto and even with the recoil making my sights jump around a bit in full auto still stayed well centered on target and got about a 1.5 inch group in both semi and full auto. My chronograph testing with lighter .20 gram BB's resulted in a 421 fps 5 shot average. 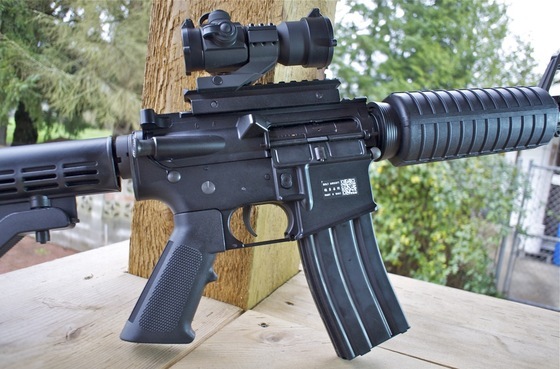 Build Quality: The Bolt Airsoft B4A1 Metal AEG Carbine is very well made with a full Metal upper and lower receiver, along with metal and polymer parts exactly where they would be on the real steel version of an actual Colt M4. The only plastic or nylon components are the stocks and the grips and perhaps some internal parts. I found the adjustable stock and magazine tolerance to be tighter than my King Arms M4A1 I previously reviewed which showed the Bolt B4A1 had a bit higher quality in the workmanship, for the most part the fit and finish was very good! Realism: As with many Airsoft guns, there is great attention to realism and the Bolt Airsoft BRSS B4A1 Carbine is another great example of an Airsoft Carbine based on the Colt M4 platform. It is an AEG but because of the BRSS (Bolt Recoil Shock System) you get a very nice compromise between a conventional AEG and a GBB (Gas Blow Back Airsoft) gun. In other words, like a standard AEG I get that endless stream of consistent BB's flying down range on target but unlike a true Gas Blow Back Airsoft gun, I don't get that drop off in power and limitation to about 30 usable rounds per magazine . What I do get similar to a GBB is that recoil action that helps make the shooting experience so much more believable! Even the sound from the Bolt B4A1 is much snapper than a standard AEG and more like a GBB. I also like the fact that the charging handle and forward assist work similarly to a real M4 and also the dust cover cleverly exposes the bolt and internal hop-up for easy adjustment along with the bolt cycling just like a GBB rifle would cycle which is similar to a real steel M4. Great attention to detail with lots of working parts. Nice high 420 real FPS. Realistic Blowback Recoil system (BRSS) for a very believable shooting experience! May not get off as many shots per battery charge as a traditional AEG because of the Bolt Recoil Shock System. Does not come with battery or charger but most higher end AEG's also do not. The Bolt Airsoft B4A1 Blowback Airsoft Carbine is a great compromise for the avid Airsofter looking for a practical skirmish weapon, but also craving the realistic experience of having blowback with recoil which up until now was really only provided by Gas Blow Back systems. I really like this concept and find it great fun to shoot even if its just for plinking in the yard. The overall quality is very good and you just have to love the M4 platform it's based on. If you're into customizing you can mix and match many external and internal parts with other existing Airsoft mechanical parts and I would imagine real steel accessories. I like mine as is with my addition of a riser and Red Dot and if I every get a chance to get out for a skirmish this will be my weapon of choice for sure!